There's something sublimely absurd about the world of modern art, something that leaves it open to brutal mockery. From the affected outfits sported by scenesters to the enormous fees the grotesquely wealthy pay for objects that make a mockery of the very idea of art, everything about the Art Basel set cries out for abuse. 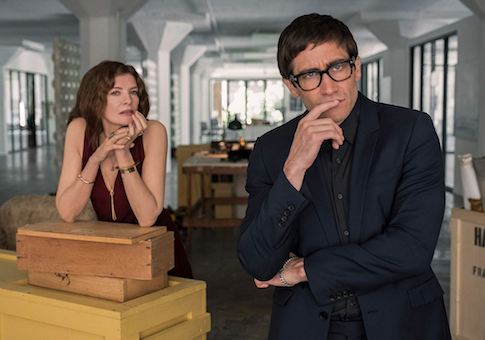 Velvet Buzzsaw, debuting today on Netflix following its premiere at Sundance earlier this week, gleefully takes aim at the archetypes of this world—behold twee critic Morf Vandewalt (Jake Gyllenhaal), with his silly name and sillier glasses; marvel at sellout gallery-owner-slash-former-punk-rocker, Rhodora Haze (Rene Russo); soak in the ruin of Piers (John Malkovich), whose abstracts have lost their oomph since he gave up booze—without breaking any real ground. More interesting is writer/director Dan Gilroy's preoccupation with the idea of artistic ownership: what happens to a work once its creator leaves the world? What obligations do we have to those who make the art we love? Morf and Rhodora are both taken aback by the work of Dease, an unknown and unheralded artist whose work is discovered by Josephine (Zawe Ashton) after his death. Dark and disturbing, the paintings—splashed on canvas, newspaper, whatever he seemed to have at hand—are mesmerizing to artists and art-buyers alike. Morf wants to write a book about the mysterious genius. Rhodora wants to figure out how to best monetize the massive backlog of work Josephine has stumbled upon. And Piers and street artist Damrish (Daveed Diggs) are so struck by the work that they are rendered nearly speechless. The audience, on the other hand, is struck when Dease's art begins murdering people who have profited off of it. Or, perhaps more precisely, inspiring other works of art to murder those who have violated his wishes. Velvet Buzzsaw has the sensibility of a dark fable, a nightmarish bit of magical realism designed to make us consider the power of art. We gain some cursory knowledge about Dease's childhood (it was sad) and learn a bit about his artistic methods (he mixes blood with his paint), but nothing we see can explain the manner in which the film's mayhem spews forth. If you can't accept a bit of fantasy in the midst of a stinging critique of the modern art scene, 2009's (Untitled)—which I quite liked upon release and strongly recommend if you find the interactions between Morf, Rhodora, and Josephine entertaining—is probably more your speed. I wish Gilroy had been a bit more focused in his storytelling. There's something to be teased out about the grotesquerie of turning art—an emotionally draining labor, one into which the artist pours his darkest thoughts and expressions—into commerce, especially the sort of commerce that more often than not treats obviously idiotic works as profundities. But the story of Dease feels undercooked, his pain and torment little more than a MacGuffin designed to get us to the kills. Jake Gyllenhaal is solid as the increasingly unhinged Morf, bringing a weightiness to a part that could have easily devolved into silliness. Morf's disillusionment with his life's work—and his increasing awareness that he has been used by those he cared for, that his critiques have been used as little more than fodder for grifters trying to make a quick buck—gives the proceedings a pathos that might otherwise have been absent. This allows him to move beyond the realm of mere stereotype, which few other characters in the film manage. One final note: I'd strongly recommend against watching the trailer for Velvet Buzzsaw, which gives away virtually everything shocking and interesting about the film in under three minutes. As a trailer it did its job: it succeeded in intriguing me about the movie. But it also destroyed my ability to experience surprise or shock—a problem, given the supposedly shocking nature of the film in question.